Just a month after the Christchurch mosque massacre, it's a bit d because it makes you see how brutal these terrorist attacks really are and how mindless and futile the cause they are supposedly fighting for. What works for this movie is the way the director executed the scenes showing you how chilling these attacks really are and there is virtually no mercy for anyone who crosses the paths of these killers. 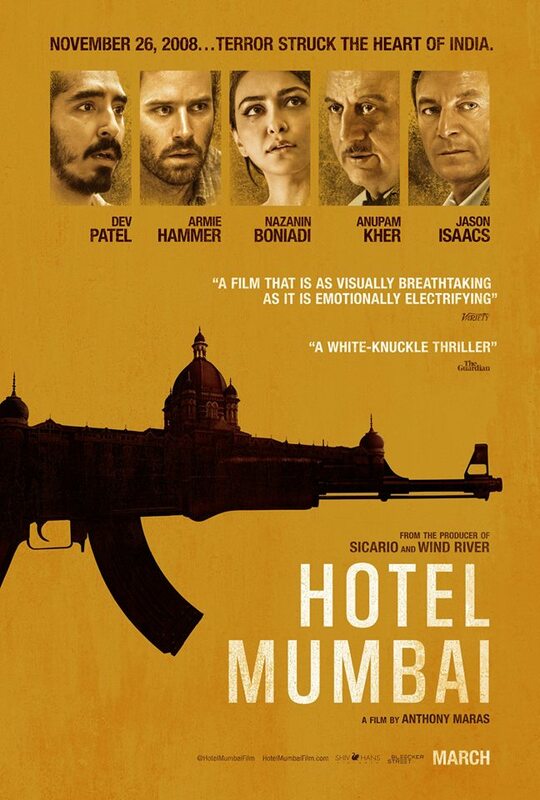 The movie focused only on three locations - the central train station, the cafe, and the Taj Mahal Hotel but in reality, they attacked 12 different locations almost simultaneously. The characters in the movie are composites of different real people and they have been obviously created to make the most impact - and they do! The killers are very young, indoctrinated and brainwashed to believe that the ordinary citizens of Mumbai are the enemy. The attacks were swift and there was no advanced warning. Once they got inside the hotel, they just shot everybody in sight and moved methodically from the lobby to each floor - knocking on each door and killing everyone inside. Dev Patel and Armi Hammer, both A-listers in Hollywood create a story of the people suddenly finding themselves in hell and being just ordinary civilians, the key was for them to stay alive until professional help comes. And I think help came too late. I am just surprised that a city as important as Mumbai has no SWAT team or Special Forces team or an anti-terrorist team that can handle these situations. If there was one, it would've saved more lives. But that's hindsight for you. Going out of the theater, I began to appreciate the strict opening of bags that we have here in all public places. At least that way, anyone bringing an automatic rifle can be flagged down and people inside can be warned - even a few precious seconds can save lives.